Researchers at the Russia-based MIPT, MSPU and the University of Manchester revealed the mechanisms leading to photocurrent in graphene under terahertz radiation. The paper is said to put an end to a long-lasting debate about the origins of direct current in graphene illuminated by high-frequency radiation, and also sets the stage for the development of high-sensitivity terahertz detectors. Such detectors have applications in medical diagnostics, wireless communications and security systems. In 2005, MIPT alumni Andre Geim and Konstantin Novoselov experimentally studied the behavior of electrons in graphene and found that electrons in graphene respond to electromagnetic radiation with an energy of quantum, whereas the common semiconductors have an energy threshold below which the material does not respond to light at all. However, the direction of electron motion in graphene exposed to radiation has long remained a point of controversy, as there is an abundance of factors pulling it in different directions. 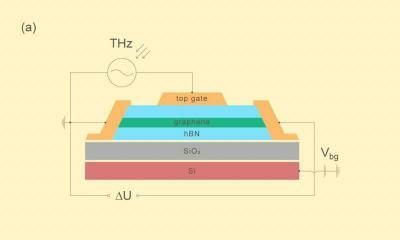 The controversy was especially stark in the case of the photocurrent caused by terahertz radiation. The terahertz detector designed in this work is a graphene sheet sandwiched between dielectric layers of boron nitride and electrically coupled to a terahertz antenna—a metal spiral about a millimeter in size. As radiation impinges on the antenna, it rocks electrons on one side of the graphene sheet, while the resulting direct current is measured on the other side. It is the "packing" of graphene into boron nitride that enables record-high electric characteristics, giving the detector a sensitivity that is a cut above the earlier designs. However, the main result of the research is not a better-performing instrument; it is the insight into the physical phenomena responsible for the photocurrent.